THE POSTCARD STYLE MURAL pops color in to the mini shelterhouse at Lions Park in Waterville. But it’s more than that. The painting by Kimberly Baerg also provides a snapshot glimpse of this southeastern Minnesota resort and farming community. Examine the details and you will see a tractor, a canoe, a buggy, a train. All important in the history of this town. 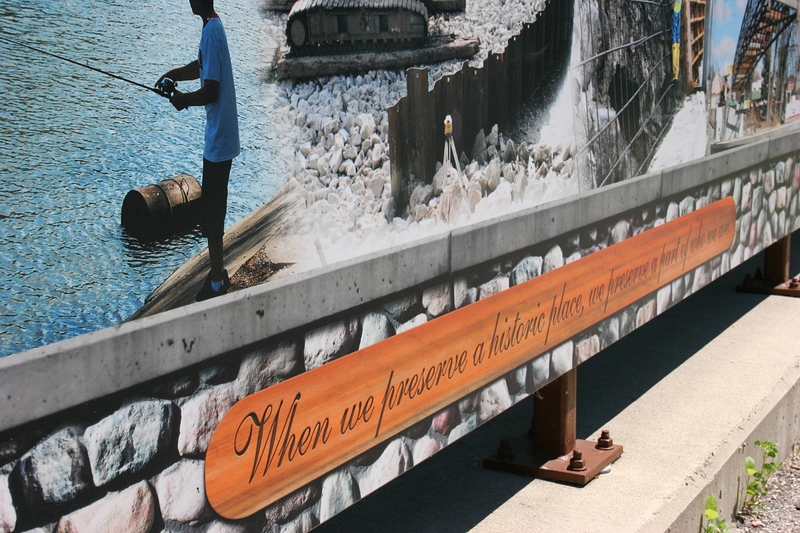 This mini mural is an example of how a little artistic ingenuity, effort and paint can transform an otherwise plain cement block wall in to a canvas that promotes a place, shares history and pops with community pride. Driving toward the landmark Grandad Bluff from downtown La Crosse, Wisconsin. The 600-foot high bluff towers in the distance. THE BRISK MARCH AFTERNOON WIND did not lend itself to standing atop a bluff. So I thought. I pulled on my hand-knit stocking cap, buttoned my wool coat, wrapped a plaid scarf around my neck and tucked my hands inside gloves. I was ready to face the fierce winter wind of Wisconsin. The view of La Crosse from this bluff is stunning. But I needn’t have concerned myself about the cold. Exiting the van in Grandad Bluff Park, I found the air still, no brutal wind slapping my skin as it had along the Mississippi River in downtown La Crosse. We—my husband, second daughter and her husband—were all surprised. We expected uncomfortable temps that would send us scurrying back to the van shortly. Rather, we found this spot 600 feet above the city to be calm. How could that be? I still have not figured it out. The city’s landmark Grandad Bluff—the highest bluff in the La Crosse area with views of Wisconsin, Minnesota and Iowa—teemed with visitors. My son-in-law John photographs my husband, Randy, and daughter Miranda. A haze hung over the distant landscape as I surveyed the scene of gridded streets, buildings exposed by naked trees, slips of water tracing through the land, distant river valley bluffs rising. It took me awhile to assimilate, to edge near the solid fencing overlooking the city. I am a flatlander, an embracer of prairie and horizontal lines, not at all a fan of heights. But with my camera for comfort, I could view the scene far below. For awhile. A flag flies atop the bluff. Nearing the top of the bluff, you’ll pass by the Apline Inn Bar & Grill, a long-time La Crosse establishment. I need to check this out. FYI: This concludes my six-part “From La Crosse” series. Click here to view a story and photos from an October 2015 visit to Grandad Bluff. Autumn is an absolutely beautiful time to view the river valley from this scenic overlook. I DOUBT I’VE EVER SEEN so many oak leaves layering the ground. Thick. Brown. Rustling underfoot. As my husband and I hiked into Kaplan’s Woods in Owatonna on Sunday afternoon, I noticed the abundance of oaks that distinguishes this city park from other parks/nature centers I’ve visited. There’s something about an oak that denotes history and strength. Yet, the distraction of all those oak leaves crackling underfoot doesn’t detract from my ability to notice nature’s details. Flash of yellow among mostly brown and grey. Bare (or mostly bare) branches set against a signature cobalt blue November sky. Fungi laddering up a tree trunk. Beautiful in an artistic, natural way. Like Nature’s sculpture. And then an unnatural road block at the end of a muddied path. “A gated community,” Randy jokes. And we laugh. Together. In the woods, under the oaks. In the dirt, initials carved with a stick, an “A” and maybe a “U.” Another Audrey? Probably not. We turn around, our path blocked. I suggest we return to the main trail into the woods. We’re unfamiliar with this place and I have no intention of getting lost. Neither does Randy. Leaves crunch beneath our shoes. But then I stop abruptly, swing my camera left toward a moss covered log, the golden light falling just right. I fail to hear or notice the runner closing in behind us. I’m in the zone, focused on photographing a selected scene. Randy, however, is watchful. He warns me. We step aside and continue on, a biker now barreling toward us on his mountain bike. …you discover a sign like this at a city park. I photographed this at Earl B. Himle Memorial Park in Hayfield, Minnesota, population around 1,300. Credit goes to my husband for spotting the sign. Check back as I bring you a three-part series of posts from Hayfield. THERE’S SOMETHING ABOUT KIDS and water on a hot summer day that brings joy and, for me, a longing for the carefree days of youth. Perhaps that is why I am so drawn to a piece of art centering City Park in Appleton, Wisconsin. “Ring Dance,” created by internationally-acclaimed sculptor Dallas Anderson, a native of nearby Neenah, is a must-see for me nearly every time I visit Appleton. On my most recent stop at the park on a hot and humid late July afternoon, I envied the cavorting carved kids cooling off in the fountain. And I envied the young women also cooling their heels in the water as they posed for bridal party photos. Not wanting to interfere with the professional wedding photo shoot, I snapped a few quick shots and called it good. Typically I would take more care in composing images, but I wanted to be respectful. I’m always curious about public art that draws me back repeatedly. This $483,000 sculpture, according to info I found online, was funded with private donations and was installed 20 years ago. “Ring Dance” seems fitting for a wedding photo shoot. Here the couple poses near a massive round flowerbed in City Park. TELL ME, do you have a favorite water fountain sculpture? I’d like to hear. 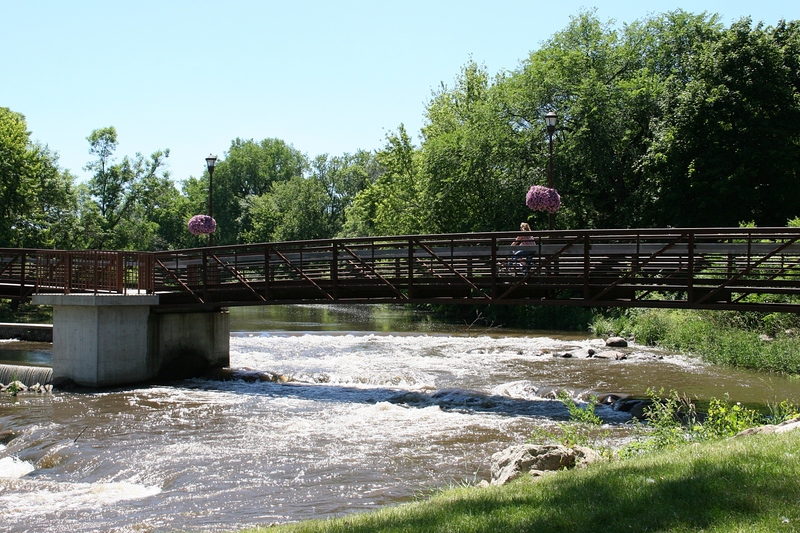 IN THE PAST FEW DAYS, after visiting Bridge Square in Northfield and Morehouse Park in Owatonna, I’ve thought about what makes a great community gathering place. 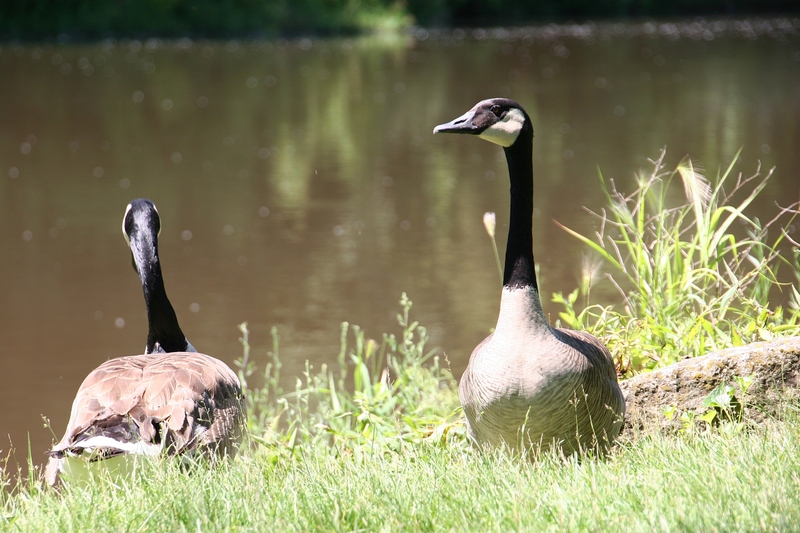 When considering a spot for a picnic or simply a place to relax, what do I seek? 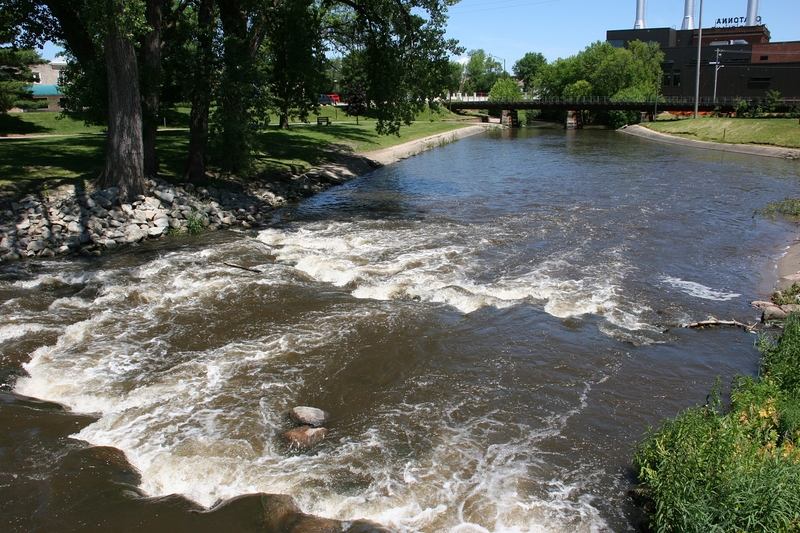 A view of the Straight River from the pedestrian bridge in Morehouse Park. Water. Whether a river or a fountain or a lake, water tops my list. There’s something about water that soothes, that eases life’s worries. I’m not a water sports person. But I love the sound of rushing water like that of the Straight River roaring over the dam in Morehouse Park or the fountain spraying in Bridge Square, just across the street from the Cannon River. 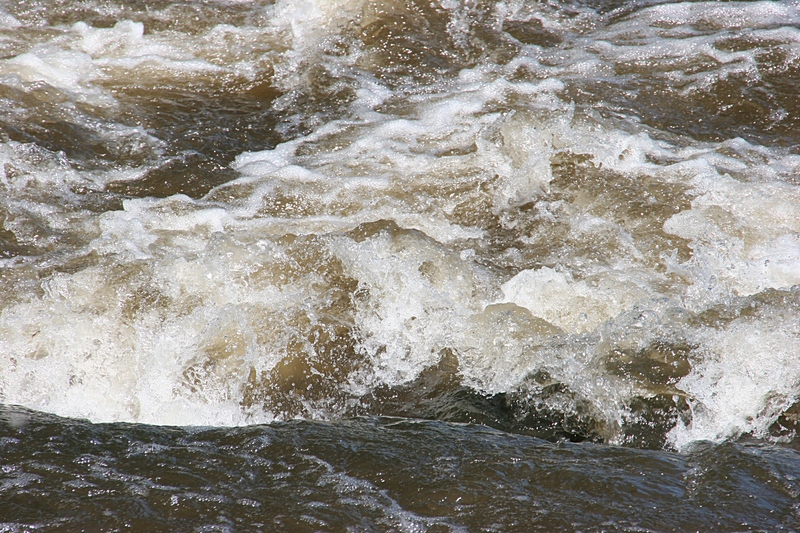 Water roars over rocks in the Straight River at Morehouse Park. 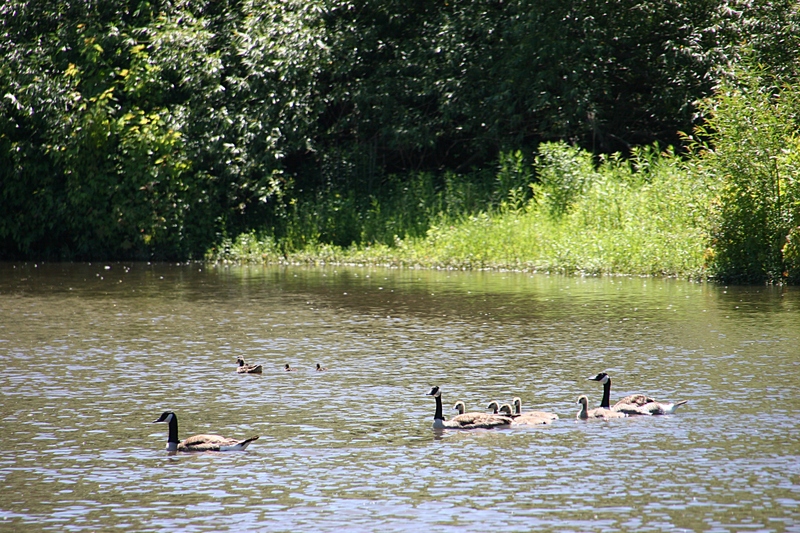 A trail of geese in the tranquil part of the Straight River. 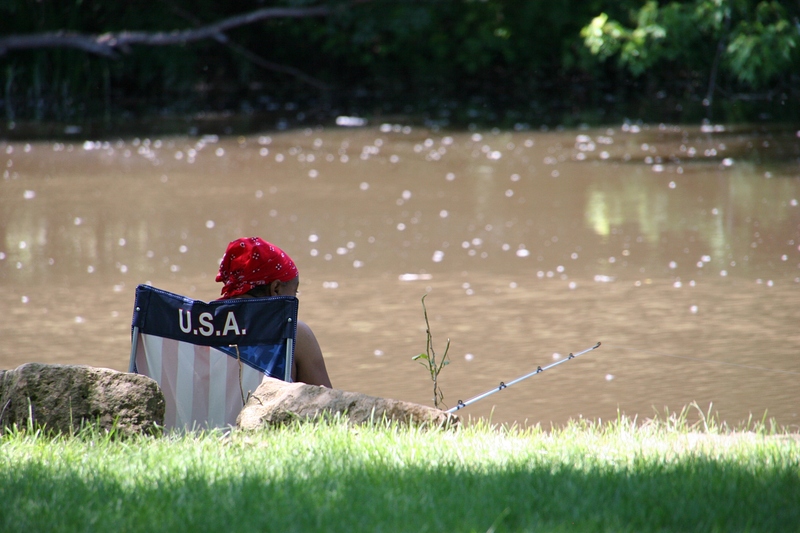 On a beautiful summer afternoon, a woman fishes the Straight River. Water offers a place to wish, to think or not, to fish, to canoe, to observe nature. Still as geese gliding. Hopeful as pennies tossed into a fountain. Turbulent water tumbling over rocks as calming as white noise. A recreational trail slices through Morehouse Park, bridging the Straight River. I also want a park that’s aesthetically pleasing, clean, green, obviously cared for and appreciated. 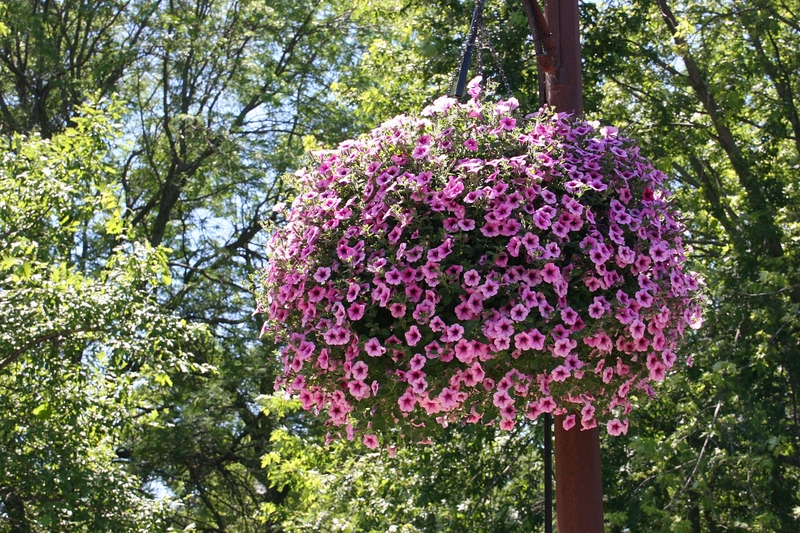 Gorgeous flower baskets hang along the recreational bridge. In Morehouse Park, generous baskets of petunias suspended from a pedestrian bridge make a statement that says this community cares. The park is a busy place with a trail winding through that draws bikers, skaters, walkers and photographers like me. At Bridge Square, the fountain entices all ages to perch beside the water, to rest on benches, to purchase popcorn from the popcorn wagon. Morehouse Park includes a playground, tennis court and horseshoe pits along with other amenities. 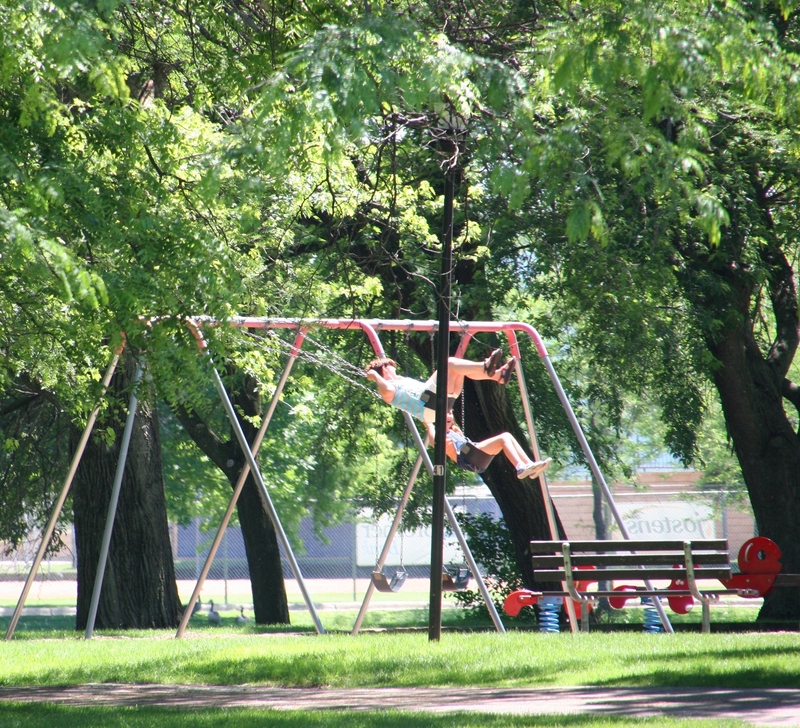 In both parks I feel a sense of community, of closeness in appreciating a beautiful spot in the heart of a city. There’s a certain vibrancy, a rhythm, a definitive weaving of people and place. 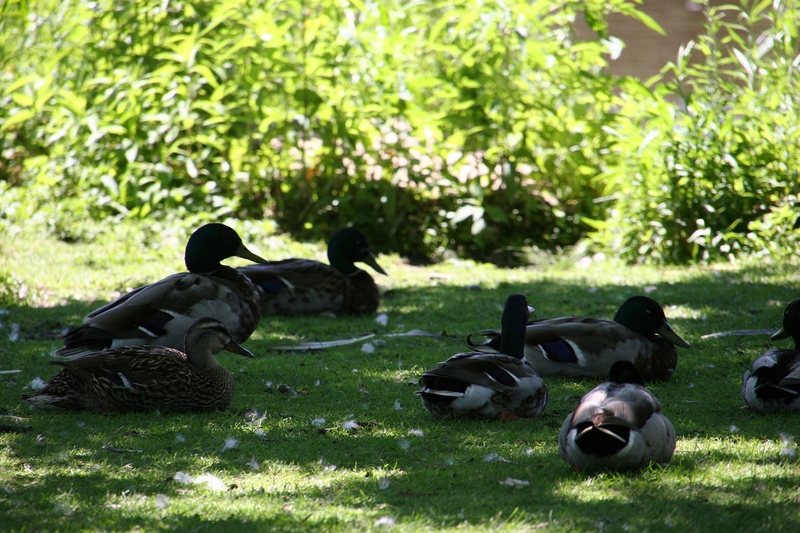 Ducks and geese overrun Morehouse Park. So watch for droppings. Everywhere. And that is what I seek in a park. Not just a picnic table under a tree. But a certain sense of belonging, of connecting with nature and community on a Minnesota summer day. 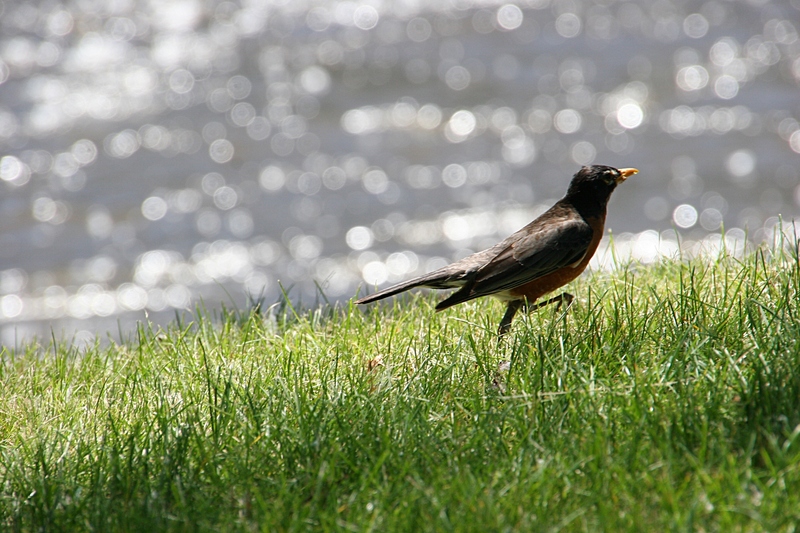 A robin hops along the bank of the Straight River in the dappled sunlight of a June afternoon. 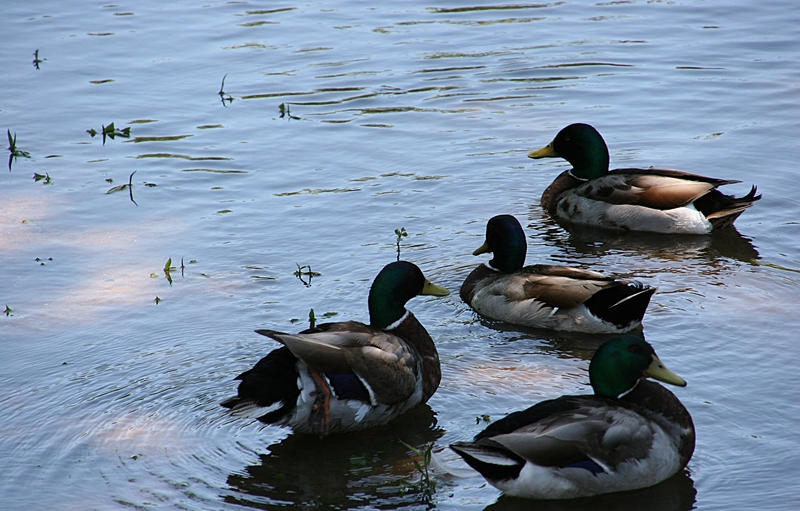 Waterfowl aplenty populate sections of the park.